What are some principles I should be aware of in doing community development? What should I know about poverty mentality that would help me better understand the people I am trying to help? 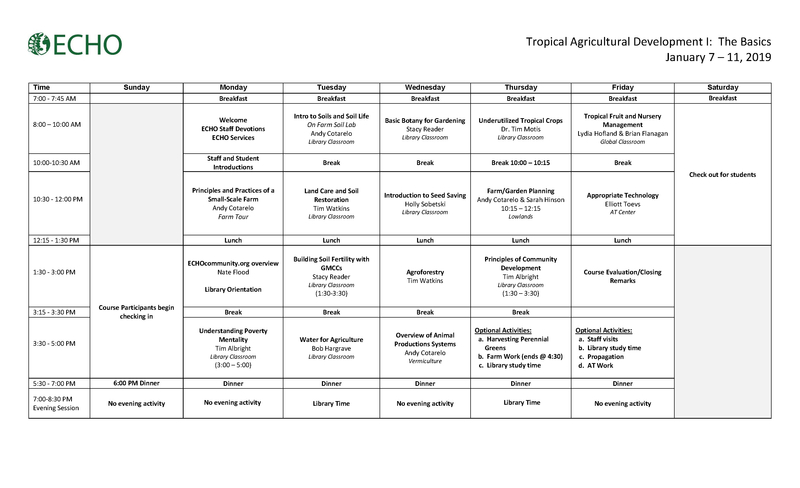 What are some key concepts regarding soils and gardening that would help me teach others to grow food plants in the tropics? What are some proven techniques or crops that I could introduce in my project area that could make a difference? We have found there are several agricultural development-related questions and issues that are dealt with by nearly everyone who studies at our campus. In too many cases, these issues are not addressed until a development practitioner has already made mistakes and encountered setbacks in their projects. Often, these mistakes could have been avoided. For instance, a basic understanding of how conditions close to the equator differ from those in more northern latitudes can help North American gardeners avoid the mistake of assuming that the plants they are familiar with "back home" will succeed in the tropics. This course is designed to equip participants with a foundational understanding of tropical agriculture and community development, as well as with some specific agricultural technologies that have significantly improved the lives of smallholder farmers in many parts of the world. ECHO's courses are taught by our experienced staff members, each with unique international experience.